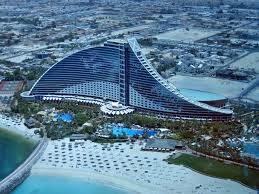 So to reflect – I’d flown from Dublin to Dubai via London with my legs crossed for over 4 hours; had gone through a gender transformation; had discovered a previously undetected disease of unknown origin; and had developed a bad case of St Vitus Dance across the Jumeirah sands. Right then….so it was all upwards from there then. Weeeell. 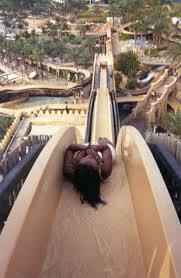 Day 2 in the Jumeirah Jungle saw us hit the Wild Wadi Park. Wadi by name, wadi by nature! 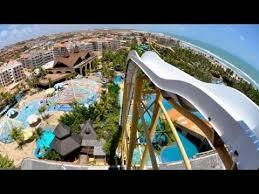 The Wild Wadi park is a water park situated on the beachside strip between the two hotels, Jumeirah and Burj. Are you having that hint of a tint of a feeling of impending doom a la Derv of the Disasters? Tick. Well, it was a beautiful day, everyone was happy, all chilled and refreshed. We walked around to check out the scene, hopped on some of the smaller rides, and whooshed our way down some of the friendlier flumes. Yay. Great fun. So, after faffing around, and, having some ice cream, we came upon this really high, helter skeltery slide thingy. “Oh look” says chirpy cheep cheep – “I’m going to give that a go! #pregnantpause. Off I went to join the queue, whilst God went off to sit pensively in the shade. I nearly passed out on the spot. BUT, the “wan” running the show was having none of it. NO I could not go back!! One way system only and this is the only way down! She put me sitting down, told me to take off my shades, lie down, fold my arms and cross my legs and not to move anything whatever I did. Which is something you should never say to me because I will automatically unravel. She pushed me. I was holding up the queue, so she need to move things “me” on! Folks – no word of a lie – I could be heard screaming down on the ground. AARRRGH! (and so forth!). And of course, what’s the first bloody thing that happens? 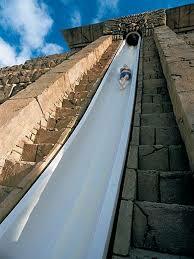 The legs unravel and start swinging up the side of the slide. I hit the bottom element at a rate of about 60mph (least that’s what it felt like), and came to an inglorious end in a large vat of water! Off the end went I, and plonk under water out of which I had to be yanked. I stood there soaked and dripping from head to toe, ‘Grace’ Kelly eat your heart out, whilst God was recovering my lost bits and pieces – shades, scrunchy, dignity, from the water; trying to keep himself from falling over with the laughter. I was gagging from all the water I had swallowed – as you do when you plunge into water with your big screaming gob open. So God kindly said to me “I think you need a drink” and hauled me off to the pool-side bar, where I necked a brandy in one. My pulse slowed down, my breathing normalised, but my dignity could NOT be found, and, with a deep sense of childish embarrassment, I ended yet another episode by showering, lying down and contemplating what it must be like to be one of those sophisticated socialites, holiday honeys, beautifully groomed, perfectly tanned with sleek hair and “all-that attitude”, but, sadly coming to the realisation that, that would never be me. Tune in next time for…. What a dis and aster! LOL Evelyn – well said.